Tuesday – Grilled Salmon with grilled asparagus and rice. Thank you to everyone who told me where to find cedar planks. We did try them, but I was really disappointed! The salmon did not have the same smokey, grilled flavor like when you lay it directly on the grates. It was so bad, I didn’t even want to take a picture of it or blog about it! So for tonight’s recipe, we went back to old faithful and laid the salmon right on the grill. I would appreciate any tips from people who use wood planks! Wednesday – Panini sandwich with pesto, fresh mozzarella, tomato, and prosciutto. Another easy dinner. My husband and I worked putting up a fence around our garden tonight, so I knew we needed something easy to make. Panini sandwich to the rescuse! I used store bought pesto. Hopefully once our garden takess off, I’ll be making homemade pesto! Place on panini press or George Foreman grill. Grill until cheese is melted. Thursday – Cheeseburgers with grilled squash and zucchni and baked beans. There’s just something about grilled veggies during summer! Can’t wait until I can use vegetables from my own garden! I season with just olive oil, salt, and pepper and use a grill basket to hold them. 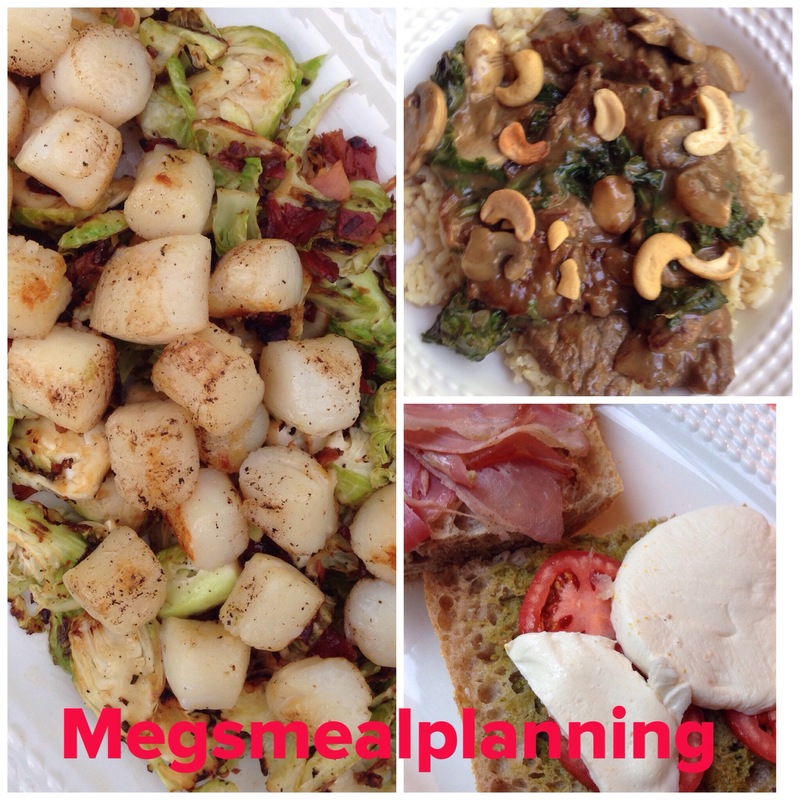 Friday – Seared scallops with brussel sprouts and prosciutto. Scallops were on sale for $6.99/lb, so I decided to treat my husband and myself! I used the rest of the left over prosciutto from Wednesday night’s panini sandwich to add to the dish. It sounds like an elegant dish, but it’s very easy and quick to make! Next week I start my CSA box and I’m so excited!! CSA stands for Community Supported Agriculture. To learn more about a CSA box click here to read about the farm I’m getting mine from. It’s a great idea because you are supporting a local farm and you get healthy and fresh produce! Everybody wins!